Members of the fifth contingent of Chinese police who were awarded UN peacekeeping medals pose for a group photo with the Chinese delegation in Pristina, Kosovo, Nov. 16, 2008. The fifth contingent of Chinese police personnel was awarded UN peacekeeping medals for its contributions to UN efforts to maintain peace and stability in Kosovo on Sunday. The fifth contingent of Chinese police personnel was awarded UN peacekeeping medals here Sunday for its contributions to UN efforts to maintain peace and stability in Kosovo. Iver Frigaard, acting police commissioner of the UN Mission in Kosovo, and Jian Shengbin, head of the Chinese delegation, awarded the medals to 18 Chinese police officers. Speaking at the medal parade ceremony, Frigaard said that China, as one of the permanent members of the UN Security Council, has offered crucial influence and contributions toward peace and security. "The contingent is dedicated, competent, hardworking and disciplined. I admire you who adapt to a culture and an environment which is so different from your own," he said. The Chinese delegation chief congratulated the officers. The medal parade is an acknowledgement of the contributions made by the Chinese police, who fully demonstrated the finest characteristics of Chinese police officers to the world through hard work and excellent performance, said Jian. 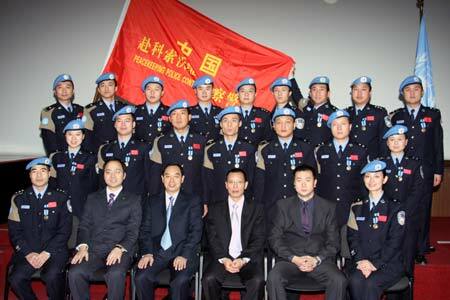 China sent its first police contingent to join the UN peacekeeping operations in Kosovo in 2004. The fifth contingent, composed only of members from Sichuan Province in southwestern China, arrived here in March for a one-year term.